Today is the day Michigan snowsports enthusiasts have been waiting for – It’s the season opener for many ski resorts statewide. Within the past couple of weeks, Michigan experienced a cold snap and ski resorts kicked their snowmaking into high gear to assist with the natural snowfall that mother nature has provided us. In the past 24-48 hours, a number of locations across Northern and Southern Michigan have seen double digit snowfall amounts, anywhere from 10″ to 20″+ depending on who you talk to. In a previous post, “Race to Open”, we checked out a number of ski areas, their snowmaking efforts and when they anticipated to open. Great news for snowsports enthusiasts as a number of resorts who anticipated a later opening date (Dec. 18th) were able to beat their expectations and open a week earlier (Dec. 11th) with more terrain than originally anticipated. Crystal Mountain opened up this morning at 9am and skiing on 36% of terrain. Boyne Highlands and Mountain opened up at 9am with 14 runs and 6 runs respectively. Shanty Creek also opened up Schuss Mountain at 9am with 7 runs. Nub’s Nob opened at 9am running on 13 trails and boasting 21 on Saturday! 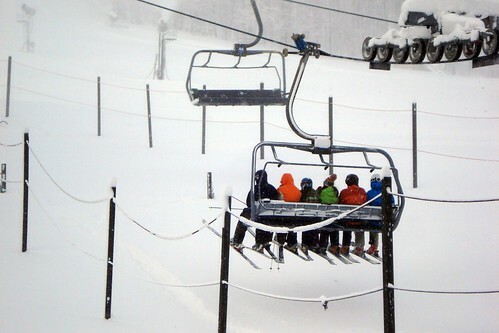 Lucky skiers catching the first chair at Boyne this morning!